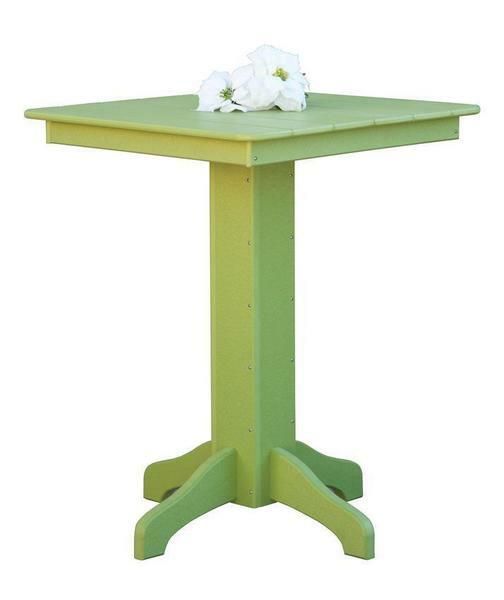 The Poly Square Pub Table is the type of furniture that everyone needs on their back patio. It is great for giving you and a friend a private place for drinks and conversation. You don't even have to worry about spills or stains as some soap, water, and a touch of bleach for the tough stains will get your poly table back to looking brand new. Matching the table with the rest of your outdoor is extremely easy as well, as we offer a wide variety of poly colors to choose from. Complete the bar table set by adding in a few of our matching poly bar chairs, and your neighbors will be jealous of the setup you have in your backyard. Please call 1 (866) 272-6773 with questions on our square poly pub table. This Poly Square Pub Table is available in a 33" square or a 44" square and also a 36" or 42" height. This is a great outdoor dining table for bar stools or counter stools. Choose from a wide variety of poly colors such as greens, blues, reds, browns and much more!